Many instruments (e.g. some options) are not available in EXANTE’s trading platform by default and have to be requested by the client. Please send your request to support@exante.eu and we will add the instrument to the platform in one day's time. Your login is the e-mail you specified during the sign-up. In case you have lost it, please contact our support. We at EXANTE aim to make brokerage easier and more transparent to our customers. Should our service fall short of your expectations, you may file a complaint. We are here to listen and work with you on any issue until they are all addressed and questions answered. 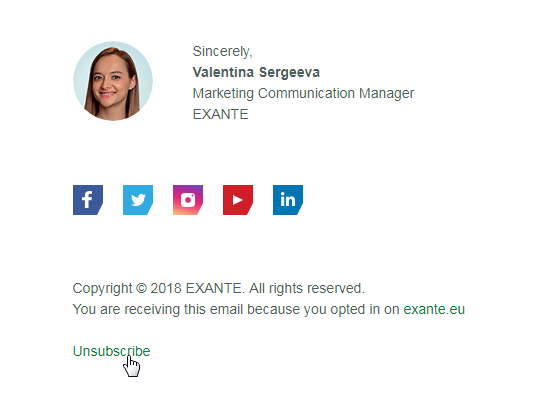 Please, do not hesitate to contact us at complaints@exante.eu for help. If you prefer, please call us at +356 20150000. We’re always here to assist you.